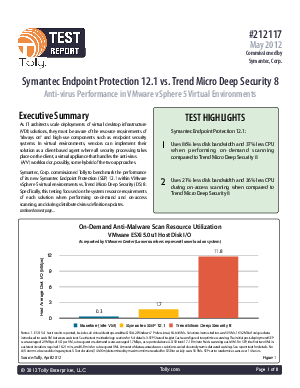 Symantec, Corp. commissioned Tolly to benchmark the performance of its new Symantec Endpoint Protection (SEP) 12.1 within VMware vSphere 5 virtual environments vs. Trend Micro Deep Security (DS) 8. Specifically, this testing focused on the system resource requirements of each solution when performing on-demand and on-access scanning, and during distributed virus definition updates. Learn More.